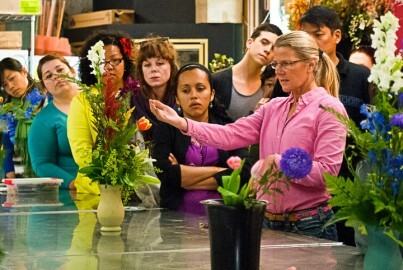 After finishing their first design of floral arrangement for this semester, 15 students in the Flower Shop Procedures and Basic Designs class gather around Jenny Tabarracci, an instructor in Environmental Horticulture & Floristry Department at CCSF, listen to her critiques on each student’s floral design. Diversity and uniqueness are long time City College’s characteristics. 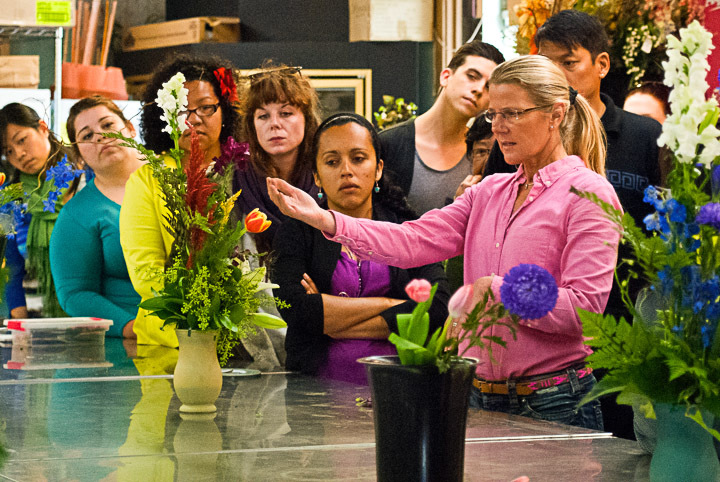 On June 27, 2013, six students from the Horticulture/Floristry Department embodied the soul of the college and placed first overall at the Student Design Competition at the American Institute of Floral Designers (AIFD) National Symposium in Las Vegas, Nev. However, City College is already international. In fact, the winning team was made up of students coming from Germany, Russia, El Salvador, the Philippines, Korea and the United States. Different cultures together with passion, dedication, talent, experience and hard work turned out to be the keys for success. Ineke Moss, Oxana Sanukova, Nicole Kastle, Ariel Ermatinger, Imelda Iraeta, Maria Pettyjohn and Sungmun Ryu are the champions who scored City College to be AIFD Student Chapter Champions for the second year in a row. City College had the largest team with six students compared to the other 14 colleges from U.S. and Canada. The competition allows a maximum of 10 students and two alternates. But “it is really a disadvantage the more people you bring,” Tabarracci said. Still, the team was well trained, especially after the five intense weeks where Tabarracci shared all of her experience. For 20 years she has attended the conference, first as a student and subsequently as an AIFD member. She has also been a full-time instructor for 13 years in the “cool and niche department,” as Tabarracci referred to it. However, there were challenges for the students to face during the competitions. Moss, winner of three individual prizes, revealed that time and nervousness were the biggest challenges for her. Also not knowing which materials they would have had to work with in the four competitions (wedding, sympathy, arrangement, body flowers) was demanding. Moss is now freelancing for renowned floral designers Natasha Lisitsa and Svenja Brotz. In the future she might open her own business. But for now, she is happy being part of the department and learning as much as possible. City College of San Francisco is AIFD Student Chapter Champions for the second consecutive year. Ineke Moss, first place wedding sympathy and body flowers. Oxana Sanukova, first place arrangement, third place sympathy. Nicole Kastle, second place sympathy. Ariel Ermatinger, second place body flowers. Imelda Iratea, Maria Pettyjohn, Sungmun Ryu contributed to the overall school award. First place individual winners also won $300. Next competition will be held July 3-7, 2014, in Chicago, Ill.